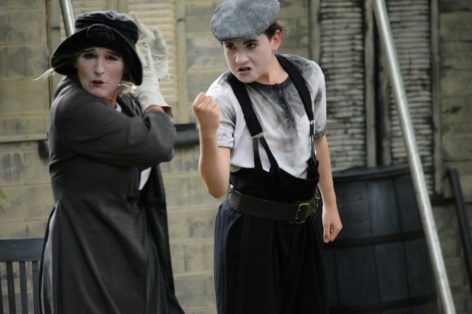 Home » Events » Bash Street Theatre – Cliffhanger! With falling buildings, dare-devil escapology, silent comedy and live piano accompaniment, Cliffhanger! has proved to be Bash Street Theatre’s most successful and enduring street theatre show. Inspired by Buster Keaton’s short film ‘Convict 13’, Cliffhanger! is a 45-minute, silent-movie style production that returns to the golden age of the silver screen. This action-packed, family show, enjoyed by audiences of young and old alike, has recently been revised and re-worked to include three new young performers, all members of the Bash Street Theatre family. The story follows the fortunes of a love-sick café waiter as he becomes innocently embroiled in a prison escape. When the heroine is abducted by a convict, there ensues a series of hair-raising episodes as our hero strives to rescue his new-found love. The evening starts at 7.30pm with music from “Mr B Presents” – the Melting Pot Cafe’s ‘House Band’ at Krowji.